Hardcover, 6.5 x 9.25 in. / 384 pgs / 300 color / 10 bw. 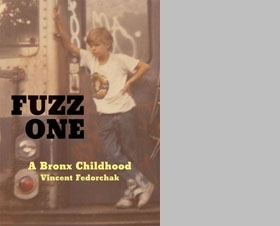 Fuzz One is the staggering, outrageous, true story of a raucous and wholly unsupervised childhood in the Bronx of the 1970s. 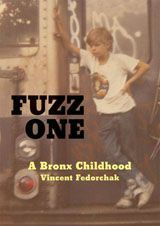 Through Vincent Fedorchak's hilarious deadpan narration of a wild existence wrought with adolescent braggadocio, we are taken on a rough journey through a deteriorating Bronx jungle-wonderland where property value was plummeting and kids ruled the streets. Whether executing a bizarre graffiti mission in another borough with all the insanity of a special ops soldier, fearlessly tracking down Satan-worshippers camped out in the old castles in Van Cortlandt Park, or being the first white boy inducted into the infamous Ebony Dukes street gang, Fedorchak never flinches. Filled with hundreds of never-before-published photos of graffiti art and Bronx cityscapes, as well as first-hand accounts of the exploits of legendary graffiti artists such as DONDI, BLADE, COMET, NOC 167, BOOTS 119, and others, Fuzz One is a guided tour of a heretofore uncharted Bronx underworld. This epic tale of youth gone awry fully captures an important era of cultural upheaval in New York City's history. It is set apart from other memoirs via the inclusion of more than 300 images, nearly all in color, that give the volume strong historical, anthropological and cultural appeal. FORMAT: Hardcover, 6.5 x 9.25 in. / 384 pgs / 300 color / 10 b&w.